Margaret Atwood. The Blind Assassin. A Reader's Companion and Study Guide. "The Blind Assassin opens with these simple, resonant words: "Ten days after the war ended, my sister Laura drove a car off a bridge." They are spoken by Iris, whose terse account of her sister's death in 1945 is followed by an inquest report proclaiming the death accidental. 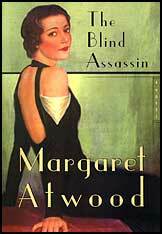 But just as the reader expects to settle into Laura's story, Atwood introduces a novel-within-a-novel. Entitled The Blind Assassin, it is a science fiction story told by two unnamed lovers who meet in dingy backstreet rooms. When we return to Iris, it is through a 1947 newspaper article announcing the discovery of a sailboat carrying the dead body of her husband, a distinguished industrialist. Brilliantly weaving together such seemingly disparate elements, Atwood creates a world of astonishing vision and unforgettable impact." —The Publisher.